RYANAIR AVIATIONS MOST EXPLOITED AIRLINE WORKFORCE .We are in no way affiliated with Ryanair. : DALMAC ANN McCRUDDEN. RYANAIR CABIN CREW RECRUITMENT SCAM EXPOSED. DALMAC ANN McCRUDDEN. RYANAIR CABIN CREW RECRUITMENT SCAM EXPOSED. Dalmac Ryanair cabin crew recruitment Scam next post.Not to be missed.Ann McCrudden of Dalmac multi millionaire thanks to TERMINATIONS of cabin crew at Ryanair.St. Joseph's Secondary School Convent Lane,Rush,Dublin.Dalmac Ryanair cabin crew recruitment scammer Ann McCrudden rents their class rooms when she has a high level of students, are St. Joseph's Secondary School taken money from Ann McCrudden knowing she is responsible for the Termination of thousands of young probationary cabin crew at Ryanair for profit. 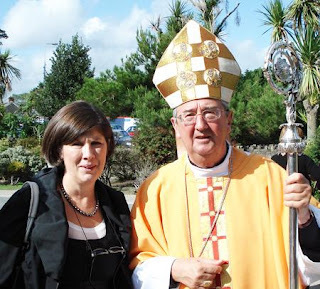 We have informed Principal Ms Patrica Hayden, time to inform The Most Reverend Dr Diamuid Martin Bishop of Dublin. Ms Patrica Hayden with the Bishop of Dublin. Ryanair head office tracked on this blog yesterday and today waiting for my next post.